CTS is one of the top leading Israeli pharmaceutical companies, operating since 1921. CTS develops, manufactures and markets high quality OTC, prescription, generic and branded pharmaceuticals, unique life-cycle products, dermo-cosmetic and toiletry lines. We are seeking new international business opportunities and welcome sales and distribution relationships. 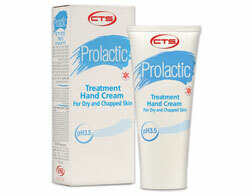 Prolactic is a new derma-cosmetics line, rejuvenating dry, cracked and irritated skin. Prolactic products, with pH3.5, are designed from a unique formula containing lactic acid and moisturizing ingredients. It protects the skin's acidic layer, provides the skin with a cleansing, nourishing and well balanced pH level.